Instead of England’s early Sunday dinner, a post-church ordeal of heavy meats and savory pies, why not a new meal, served around noon, that starts with tea or coffee . . . By eliminating the need to get up early on Sunday, brunch would make life brighter for Saturday night carousers. Well, what a grand idea! The idea of brunch grew in popularity – whether your brunch is a family affair or a way of socialising it’s usually a relaxed, weekend event often with buffet style food. 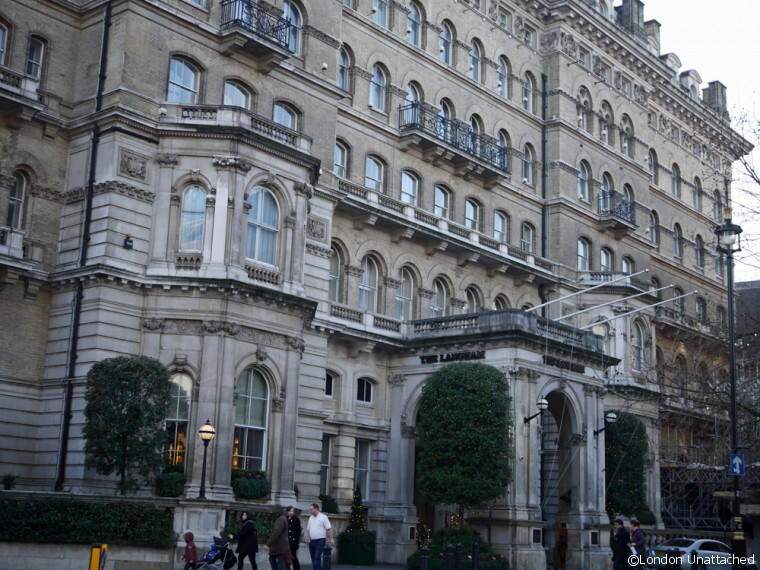 The Langham, London hotel, on Regent Street, opposite BBC Broadcasting House and All Souls church, is a magnificent, imposing, traditional place that I know best for their very special afternoon tea, served in the Palm Court. 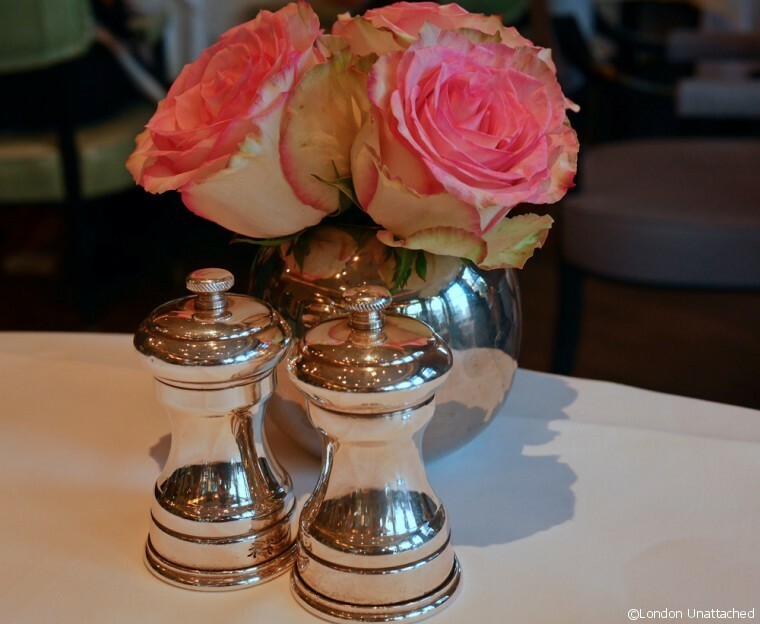 But, there’s more on offer and I was delighted to be invited to Roux at The Landau, the hotel’s main restaurant, for Sunday Brunch. 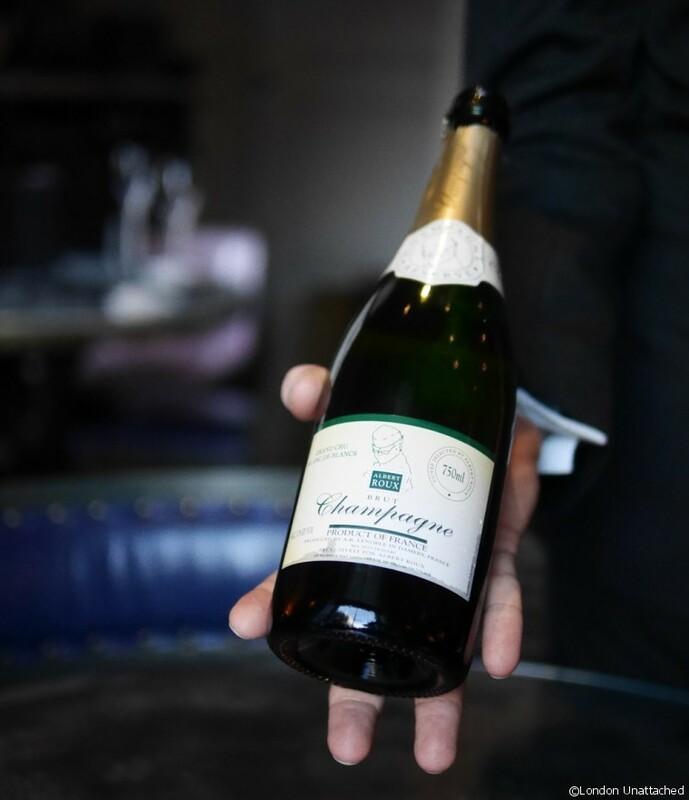 Sipping on a glass of Albert Roux’s own champagne cuvee as an aperitif, it became obvious that what we were about to enjoy would be a distant cry from the average brunch menu. 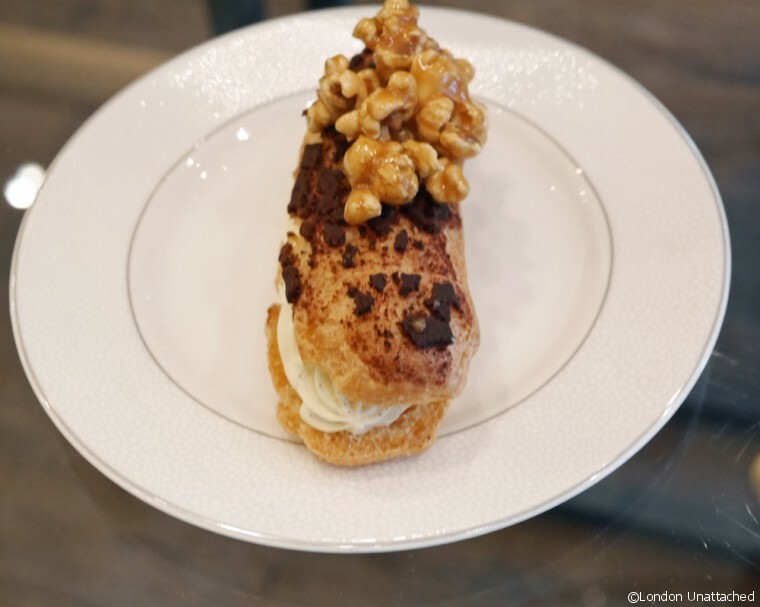 Brunch at The Landau is a three-course affair, with only the desserts served buffet style. 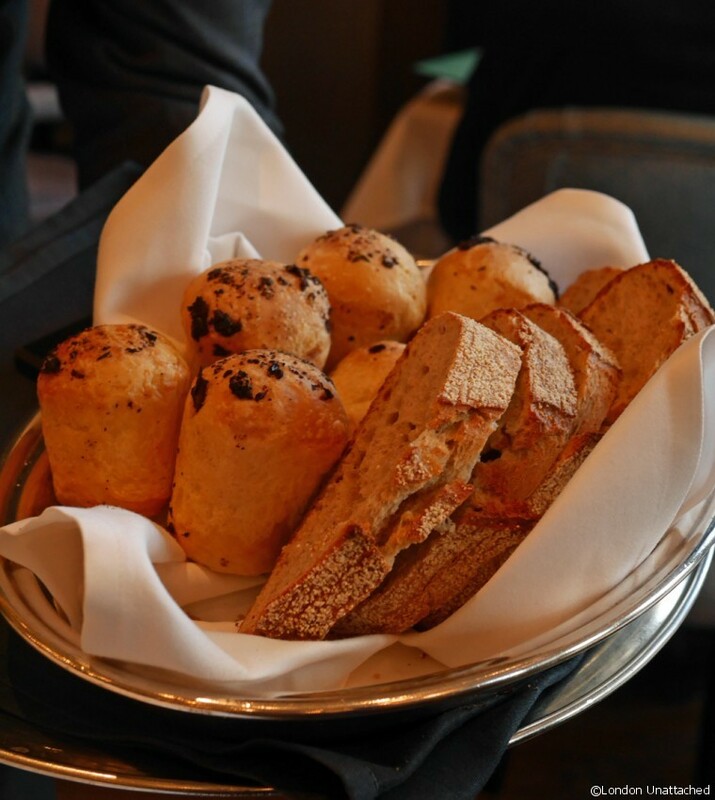 To start, there is fresh bread – sourdough or olive rolls and a choice of five dishes. My companion chose Forman’s smoked salmon, sliced freshly for her and served with a dainty garnish of salad leaves and lemon, paired for her with a glass of 2013 Ata Rangi Sauvignon Blanc from Martinborough New Zealand. I indulged in a rich, creamy brandy scented lobster bisque with a glass of Macon Fuisse Domain Cordier Pere et Fils from Burgundy, a buttery chardonnay which paired beautifully for me. 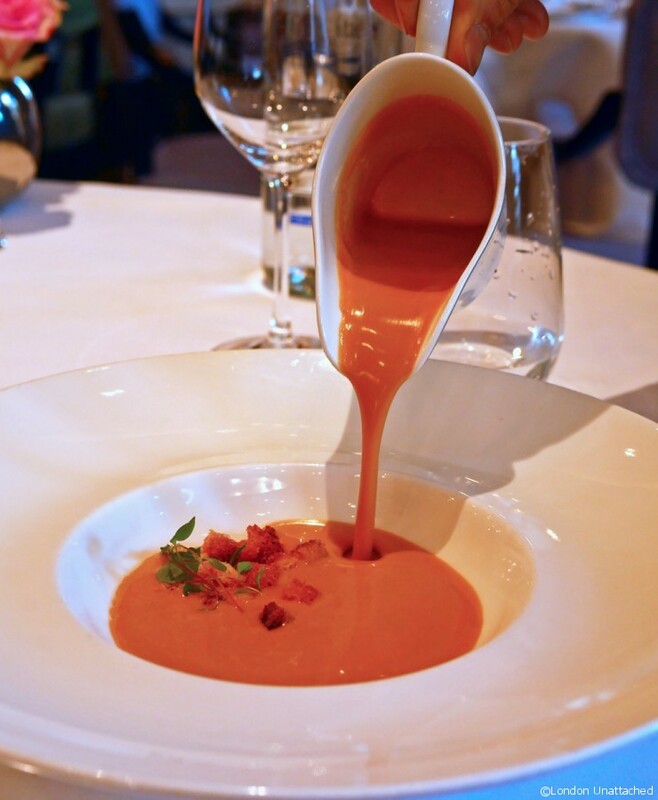 Pure comfort food, a good lobster bisque has a wonderful velvety texture and a distinctive shellfish aroma which, laced with brandy, is like being wrapped in an indulgent blanket that promises great taste to come. And, the promise was beautifully realised, complemented by a handful of crisp croutons. Meanwhile, we’d spotted the special for the day, Beef Wellington. Always a treat, I’ve actually never tried ordering Beef Wellington in a restaurant setting. 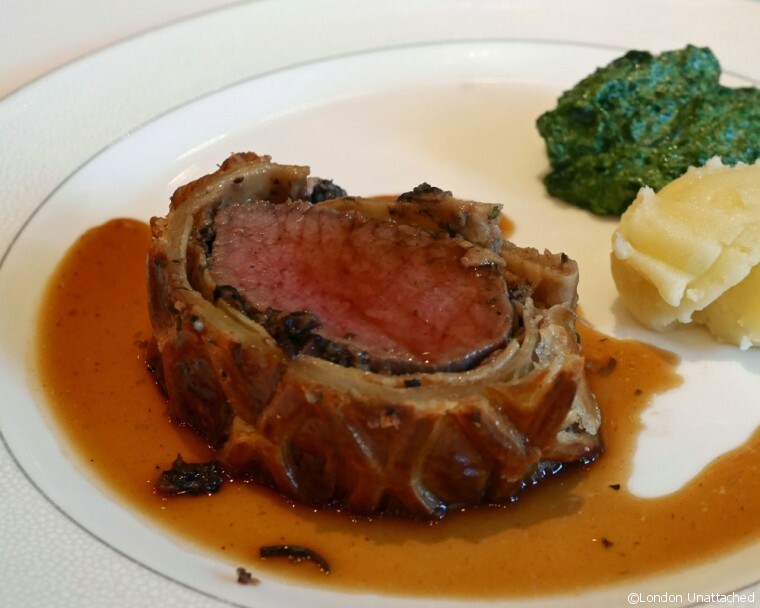 I’ve struggled to understand how it can be produced well in a commercial environment – it depends on perfectly cooked beef fillet, encased in mushroom duxelles and a flaky pastry shell. How do you produce something like that in a way that can be served to order? Well, I still don’t know the answer – but I do know that the result here was perfect. The meat medium-rare (I suspect if you wanted a well-done portion, then the end pieces would have been on offer) and the pastry beautifully light and crisp. The dish was served with traditional accompaniments of creamed spinach and mousseline potatoes. All washed down with a glass of Cotes de Bourdeaux, B de Biac Cadillac 2011, a cabernet sauvignon blend that was fruity and spicy without being overly heavy. 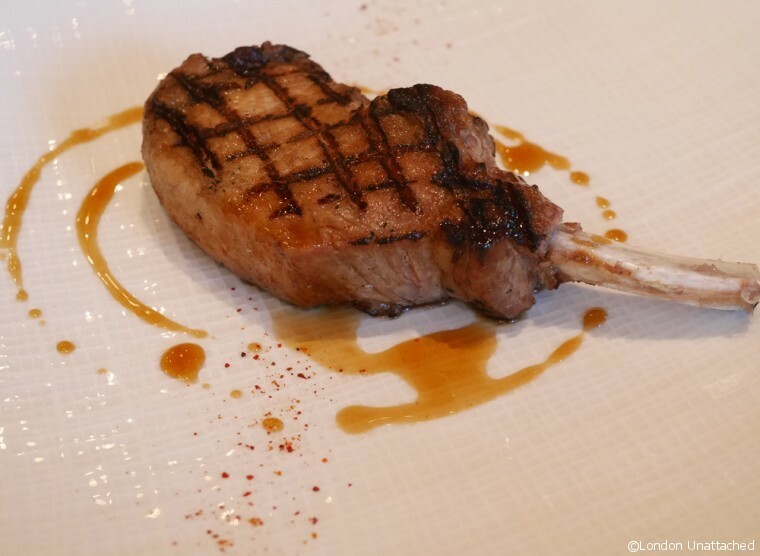 My companion’s roast Iberico pork chop looked stunning. And, even from where I was sitting I could smell the fresh rosemary that was used to scent the chips. A tiny pot of aioli completed her dish. Her dish was paired with a Chateauneuf du Pape, Chateau la Nerthe, 2011. 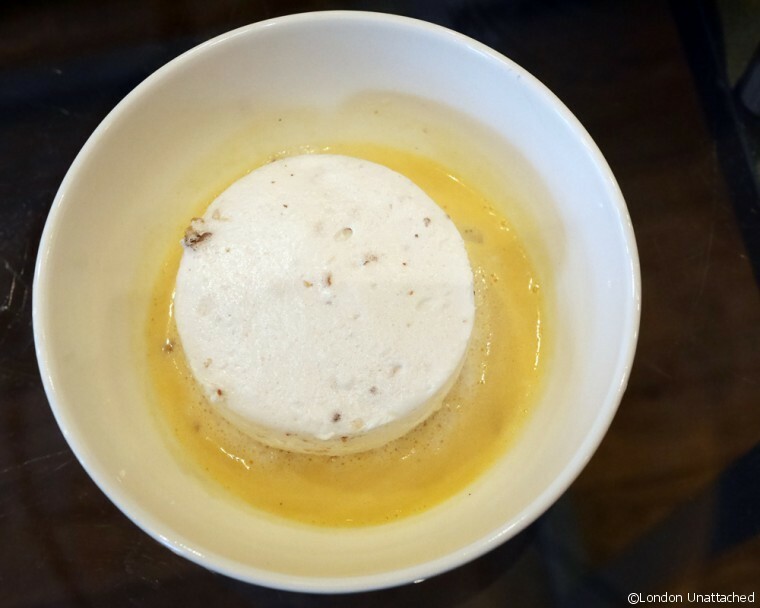 And, the ile flottante in creme Anglaise was another of those dishes which I’ve never dared order in a restaurant. Here it looked divine. 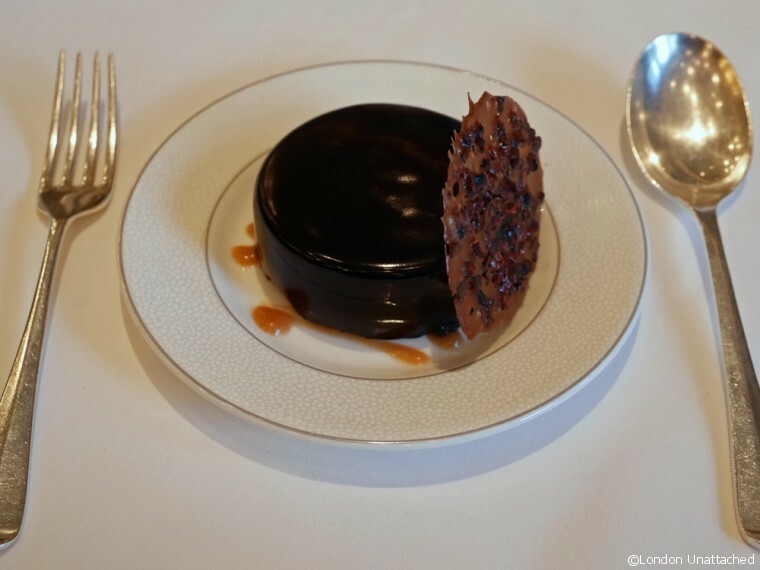 In the end, I chose the bitter chocolate mousse with cocoa nib tuile and salted caramel. 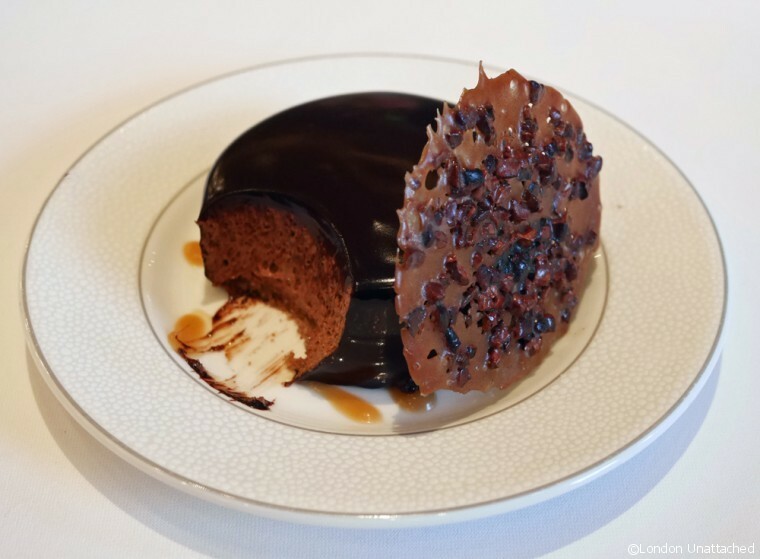 A soft, dark chocolate ganache encased the lightest of chocolate mousse. Anything this beautiful has to be calorie free don’t you think? 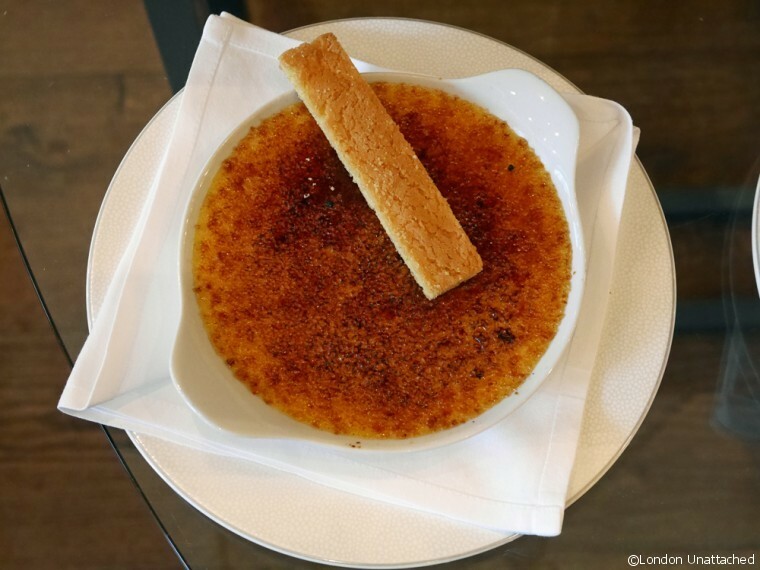 The creme brulee chosen by my companion looked spot-on too, with a fine burnt caramel top and a delicate sable Breton finger. We eschewed a dessert wine – after all, it WAS lunch time – instead, enjoying a cup of fresh coffee to finish off the meal. We were particularly impressed by the level of service which managed to be fast and helpful without being in any way intrusive. And, of course, by the food and impeccable wine matching. 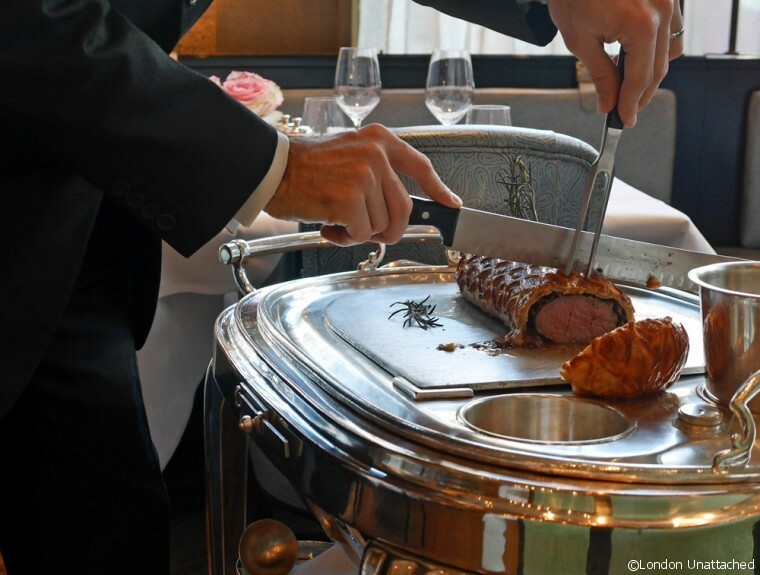 It is only recently (in April last year) that the father and son team of Albert and Michel Roux Jr.were given a new contract, extending their work at The Langham, London to manage the entire food and beverage offering. 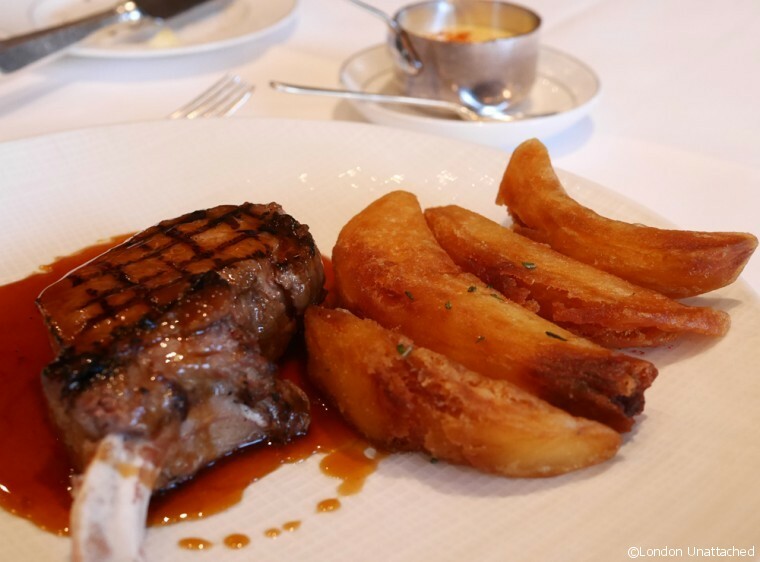 At the same time Chris King, then Head Chef of Roux at The Landau was promoted to Executive Chef for the hotel while his sous chef Oliver Boon was promoted to be the new Head Chef of Roux at The Landau. My impression is that the entire team operates together like clockwork. Just as it should be, but seldom is. 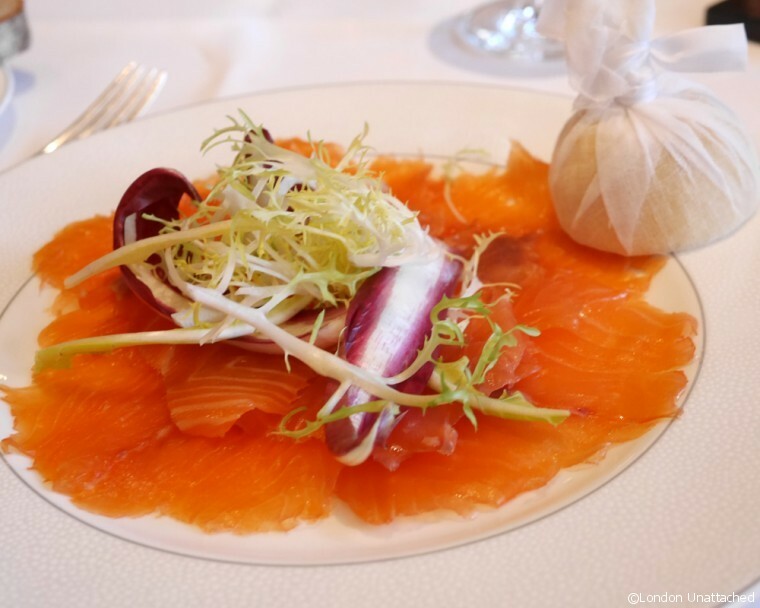 Brunch at Roux at The Landau is a special occasion. But, it’s one that is entirely affordable and would make a perfect post-Christmas treat. The menu, with five options at each stage and inclusive of a glass of champagne, is £45 per person. A lovely and relaxing way to spend the afternoon catching up – and one that definitely meant skipping supper was in order. 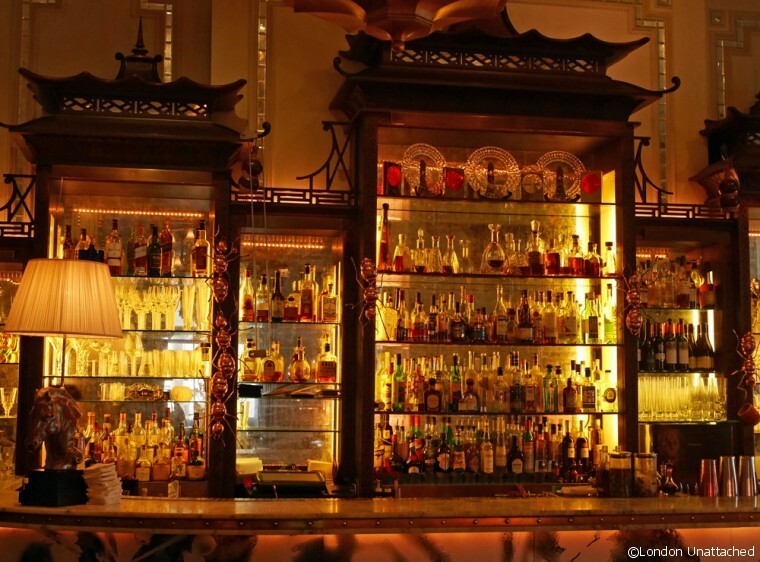 Sure does look divine, it’s definitely one of The best in London.